We provide complete service facility to our valuable Customers. Specialist engineers are available for troubleshootin, erection & commissioning, supervision and complete overhauling of Cranes. We deals in all types of spares of cranes, AMC and maintenance workin All types of spares of cranes, AMC and maintenance work. Backed by the experience, we are offering a qualitative range of Crane Maintenance Service. Provided services are executed using modern technology. Apart from this, our clients can avail these maintenance services as per their requirement within promised time limit. We take a huge pleasure to introduce ourselves as best presenter of Crane AMC Service. 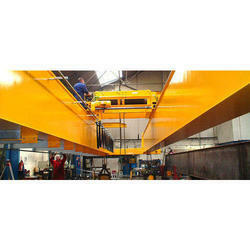 These crane services are performed by our experts. Our experts are qualified and skilled in this realm. These services are quick and best in class. Our customers can avail these crane services at affordable rates for us. We have been counted amongst the most trusted names in this domain, engaged in providing Crane Maintenance Service. Spares :- We supply various essential spares required for cranes such as gears and pinions of different type of gear boxes, wheel assembly, brake drum, shoes, liners for brakes, wire ropes, sheaves, Hooks and other electrical spares required for EOT Cranes at very competitive prices. We are providing general maintenance of all machines like lathe, drilling, power press, rolling Mill, cement plant, gear boxes.EOT Cranes etc. Our team are well qualifiedand expenienced technicals having good knowledge of all machines. We are providing repair and services at very nominal rate.We also provide AMC at very good price. We provide complete range Parts & Service for all TATA-TFC 280, TFC 75, 320, 655ALC, 955ALC Cranes, FUWA-QUY35, QUY55, QUY70, QUY80, SANY, KOBELCO & LIEBHERR-LR1100, 1130, 1160, 1200, 1250, 1600, LTR-1060, 1100, 1220, LTM1040, 1060, 1070, 1100 Crawler cranes. Banking on the individual requirements of the clients, we offer well-planned array of Crane Maintenance Service. We understand the requirement of clients and deliver the entire service accordingly. Our maintenance services are authentic and ensure maximum output result. From simple quarterly services on a few pieces of equipment to complete full-time, on-site maintenance partnerships to service hundreds of cranes, Invisn offers maintenance programs that can be customized to the needs of your equipment and production. We also offer in-depth analysis of current maintenance programs and recommendations for improvement.